Do You Know What to Eat for Energy? It’s almost Spring! I hope you have been enjoying our warming weather and longer days. It’s a great time to enjoy the outdoors with family and friends. The time outside makes us feel great but do you know what to eat for energy? There are a number of reasons why you might be lacking energy such as lack of quality sleep (especially if you suffer from sleep apnea), lack of fitness (it seems as if exercise may cause fatigue but actually, the opposite is true), or eating the wrong types of foods or the wrong “ratio” of macronutrients. This final reason is what I am going to focus on here. Carbohydrates are the body’s most efficient source of fuel. Whether simple or complex, they are all broken down into sugars – called glucose. When your muscles and organs have used all the glucose it needs, your body then stores this sugar as body fat. Proteins break down into amino acids which are used to build and repair your body’s tissue. Animal proteins (meats, fish, poultry, dairy and eggs) are complete proteins while plant proteins (beans, rice, vegetables, nuts) are considered incomplete. The exception to this is soy protein. You cannot live without protein! Fats also provide energy but not as readily as carbohydrates. Food fats are essential for the proper functioning of your body. They provide essential fatty acids that your body cannot make. They are found in meats, fish, poultry and dairy products. So in a very simple explanation, you may get quicker energy from carbohydrates but once broken down into sugar (rather quickly), your blood sugar increases and your pancreas begins to produce the hormone insulin. Insulin then causes your blood sugar to go down (often causing transient hypoglycemia depending upon the amount and type of carbohydrate ingested) and can result in feelings of fatigue, hunger, nausea and other negative symptoms. You may then eat to combat these symptoms and begin this cycle all over again. By the way, another side effect of insulin is fat storage. I mentioned you might lack energy because of the wrong “ratio” of nutrients. As the simplest explanation (even works for my kids), you should try to eat foods that have at least double the amount of protein than the amount of carbohydrate (2:1 ratio of protein:carbohydrate) to combat these swings in your blood sugar and excessive insulin production. Keep your blood sugar stable and those negative symptoms usually improve (and you have more energy as a result). Of course, there is more to it than that but that’s why we created Weight Management University™ and My Weight Loss Academy™! 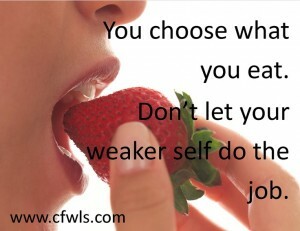 If you have questions, send them to us at success@cfwls.com. Who knows – your question might be addressed in our next weekly Podcast or our next Webinar for Losing Weight USA (www.losingweightusa.com). I look forward to seeing you soon! This entry was posted in Newsletters, Uncategorized, Weight Loss Nutrition and tagged achievement, bariatric, CFWLS, diet, Dr. Thomas Clark, eating, energy, food choices, goals, low carb, patient support, protein, success, tips, weight loss, weight loss surgery on March 16, 2015 by CFWLS. This entry was posted in Podcasts, Weight Loss Surgery, Weight Loss Surgery Success and tagged #surgical weight loss, b complex injections, b vitamins, b-complex vitamins, bariatric surgery, energy, seight loss surgery, weight loss on August 20, 2014 by CFWLS.